Series edited by: Hans-Jürgen Sasse †, Mauro Tosco. 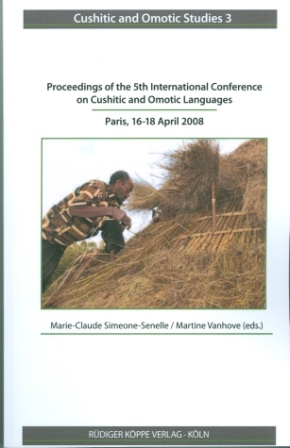 Beginning with volume 1 of the new series Cushitic and Omotic Studies the previous series Cushitic Languages Studies will be continued, now being extended to manuscripts on the Omotic languages of Ethiopia, as well as works on cultural studies which not necessarily have to be linguistics. The contributions to this series are double peer-reviewed. Author: Graziano Savà, Mauro Tosco, Giovanni Toselli, Giuseppe Goletto, Colomba Banal [show more…], Giovanni Chiomio. Translated by: Graziano Savà, Mauro Tosco. With an introduction by: Graziano Savà, Mauro Tosco. Edited by: François Enguehard, Marie-Claude Simeone-Senelle, Martine Vanhove, Yvonne Treis. In collaboration with: Danielle Bonardelle, Jeanne Zerner. With an introduction by: François Enguehard. With contributions by: Paul Trevor William Baxter †, Derar Saleh Derar, Eike Haberland †, Hailee Fidaa, Abdallah Mohamed Kamil [show more…], Ioan M. Lewis †, Michel Perret, Karel Petrácek, Chaim Rabin, Hassan Mohamed Salih, Hans-Jürgen Sasse †, Alessandro Triulzi, Andrzej Zaborski †. Edited by: Marie-Claude Simeone-Senelle, Martine Vanhove. With contributions by: Mohammed-Tahir Hamid Ahmed, Azeb Amha, Roger M. Blench, Joachim Crass, Loredana Cupi [show more…], Gene Gragg, Bernhard Köhler, Maarten Mous, Ongaye Oda Orkaydo, Sara Petrollino, Gérard Philippson, Graziano Savà, Rolf Theil, Dawit Tilahun, Mauro Tosco, Rainer Voigt, Kjell Magne Yri.